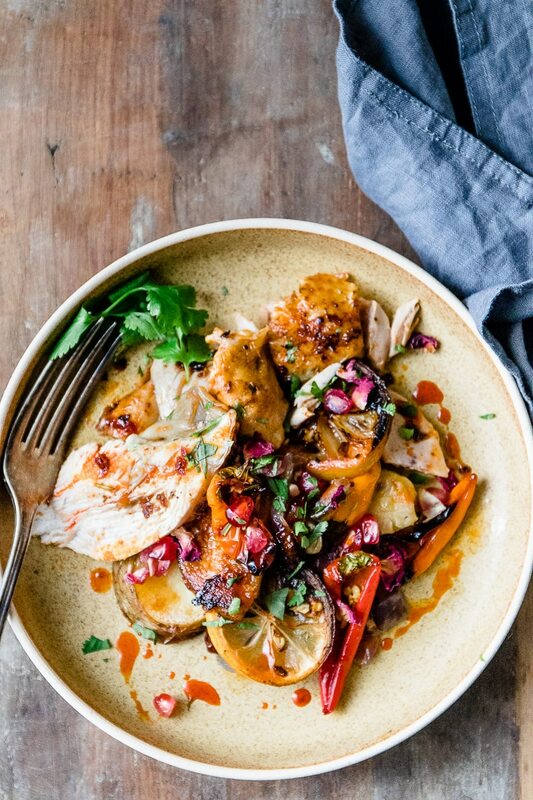 This spicy and aromatic Harissa chicken tray bake is a simple yet impressive dinner that will become a new family classic. 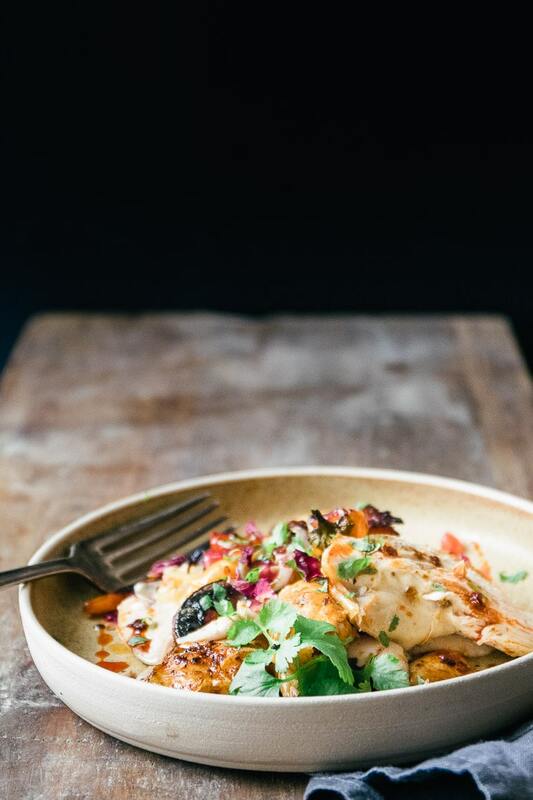 Crispy golden-skinned chicken smothered with spicy Harissa paste and roasted on top of seasonal vegetables. Hey Everyone! I’m super excited about this month’s Salted Mint post here on Sugar & Soul! And it’s an awesome one this month! One pan wonders are my jam, like this one pan lemon chicken, and this Harissa chicken tray bake may be one of the best I’ve made yet! Clearly, one tray dinners are a life saver at this time of year. To be fair, they’re a lifesaver any time of year. But as we head into the cold, dark months of winter, sheet pan dinners are especially welcome. You toss everything on one tray and pop it into the oven and you’re done. Perfect for any night of the week, but especially weeknights. 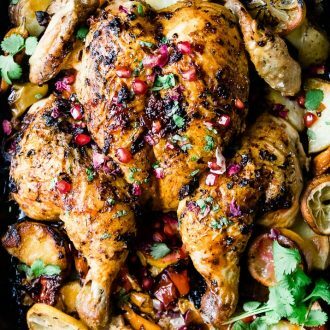 This Harissa chicken tray bake is exactly what you’re looking for this time of year. 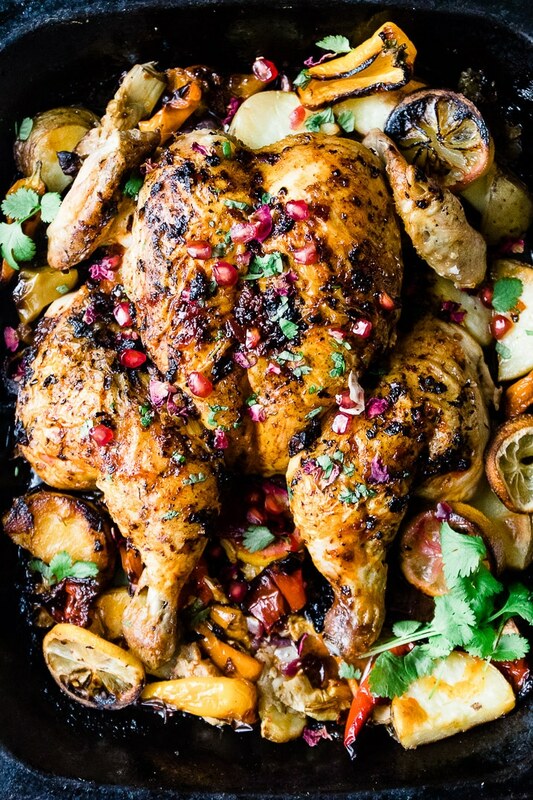 It’s truly the sunny warm taste of Morocco on a sheet pan. If you’ve never used Harissa before, it’s a spicy aromatic paste from North Africa, made from chili, spices and sometimes rose petals. <- My personal favourite is the rose Harissa versions of this paste, but if you can’t track down rose Harissa, then regular will work like a dream too. I’ve chosen to butterfly the chicken for this Harissa chicken tray bake so that it cooks quickly. But this dinner is just as delicious if you leave the chicken whole. To butterfly the chicken, simply use a sharp knife or kitchen shears and cut down either side of the backbone out of the chicken. When I created this dinner, I did set out to make a simple and delicious, but the fact that it’s a 6-ingredient dinner is a super bonus. I figure that should mean about 10 minutes in the grocery store to get the ingredients for this dinner. And that is a winning one pan dinner recipe. If you are butterflying the chicken, use a sharp knife or kitchen shears to cut down both sides of the backbone and remove. While the oven is preheating cut the vegetables and place on a large baking tray. Toss with the olive oil and season with salt and pepper. Place the butterflied chicken on top of the vegetables and rub with the Harissa paste. Season the chicken well. Place the lemon slices around the chicken. Bake in the preheated oven for about 35 minutes or until an internal temperature of 165 is reached and the juices run clear. Garnish with the pomegranate and cilantro. 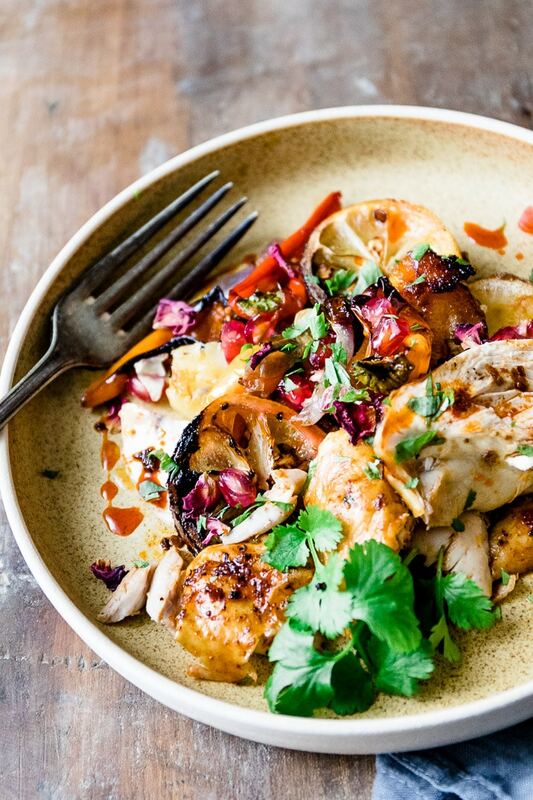 Pin this Harissa Chicken Recipe for Later! All I can say is WOW. Making this soon definitely! It’s such a great dinner recipe! You totally sold me with how easy this dish is! Easy always wins 😀 Loving all those flavors, too! I love harissa and chicken recipes, definitely one of my favorite ingredients to include in chicken recipes. Thank you so much for sharing this! Can’t wait to make this recipe the next time I head to the grocery store.